A daytime summer solstice rose: 'Sir Walter Raleigh'. 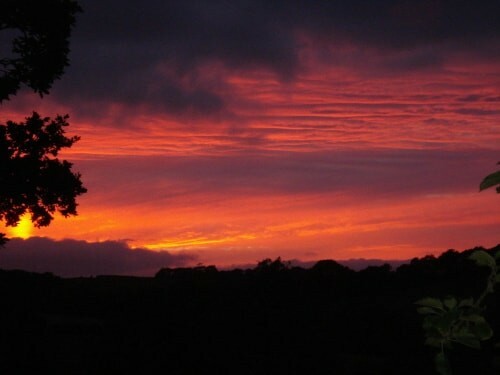 Above shows the summer solstice sunset over the farm. Another busy month in the maternity wards, thanks to Effie, Edith and Pandora Pigs. Two of them kept us on the hop by being very late. So there was a lot of regular mid-wifely checking at all hours. All mothers and piglets are doing very well and the piglets are scampering about happily. It wasn't just the pigs that were busy either. The humans got the silage made, mended and re-fenced some of the pig paddocks and stacked an enormous quantity of logs in readiness for the winter. Not to mention thistle-thwacking in the orchard with a scythe. The sheep got shorn as well and are looking cool, small and pretty. Shetlands are a different colour underneath their fleeces. So the gingery Moorits now look chocolate coloured until their wool grows back. We hand-sheared the rams. It started well... Jaggers Ram decided that he enjoyed being shorn and simply sat down and relaxed while being clipped. Magwitch Ram was a bit wriggly but well-behaved. But Gus Ram decided he didn't want to be shorn at all and turned into demon-ram. Gus got a nice tidy haircut in the end though it took longer than normal. You have to be very careful shearing Shetland rams because they have such large curly horns. My plan is to make some rugs with the lovely multi-coloured fleeces that are now filling a massive wool sack.